This page is about the former Pennsylvania city. For other uses, see Allegheny, Pennsylvania (disambiguation). Allegheny City (1788–1907) is the name of a former Pennsylvania municipality now reorganized and merged into the larger community, the modern City of Pittsburgh, Pennsylvania. 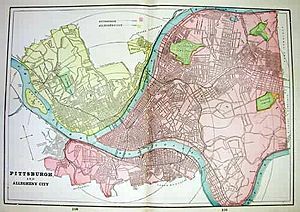 Allegheny City was a right bank municipality located west across the Allegheny River from downtown Pittsburgh, with its southwest border formed by the Ohio River and is known today as the North Side of Pittsburgh. It was annexed by Pittsburgh in 1907. Its waterfront district, along the Allegheny and Ohio rivers, is known as Pittsburgh's North Shore — it is along the north side of the confluence of the Allegheny River with the Monongahela, where they form the Ohio River — the locale achieved fame as the riverside site of Three Rivers Stadium. The City of Allegheny was laid out in 1788 according to a plan by John Redick. The lots were sold in Philadelphia by the State government or given as payment to Revolutionary War veterans. It was incorporated as a borough in 1828 and as a city in 1840. Prior to the 1850s, most of the area was still largely farmland, but was subdivided into residential lots, first for the growing German population and later for Croat immigrants. It was commonly referred to as "Deutschtown," derived from the German word Deutsch, referring to the language and ethnicity. The Priory is really two historic landmarks - the 1852 St. Mary's German Catholic Church and the adjacent 1888 home for Bavarian Benedictine priests and brothers. Once a largely German parish, the church later merged with nearby Italian and Polish congregations. The church and rectory have since closed. The buildings are operated as a banquet hall and a bed-and-breakfast. Although Penn Brewery began in 1987, it is housed in the old Eberhardt & Ober Brewery (1882-1906) buildings. Penn Brewery makes the award-winning Penn Pilsner and a number of other specialty beers. The "tied house" (brewery owned restaurant) features a full German menu and live music. The Mexican War Streets were laid out in 1848 by General William Robinson, Jr., who later was elected as mayor of the city of Allegheny. Just returned from service in the Mexican War, he subdivided his land and named the new streets after the battles and generals (Buena Vista Street, Filson Way, Monterey Street, Palo Alto Street, Resaca Place, Sherman Avenue, Taylor Avenue) of that war. 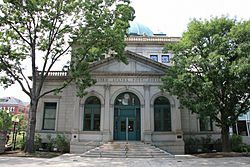 The original Allegheny Observatory was built in 1859 near Perrysville Avenue, by prominent Allegheny citizens who formed the Allegheny Telescope Association. The association donated the observatory to the Western University of Pennsylvania (now the University of Pittsburgh) in 1867, after which it was used for astrophysical, solar, and planetary studies. The observatory maintained a successful subscription time service to railroads via telegraph for many years. A new Allegheny Observatory was built between 1900-1912 in today's Riverview Park. It is owned and operated by the University of Pittsburgh for education, astronomical research, and public lectures and tours. Allegheny, Pennsylvania Facts for Kids. Kiddle Encyclopedia.